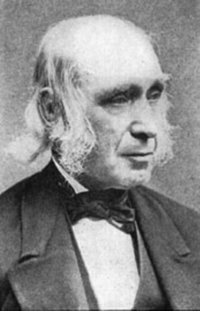 Amos Bronson Alcott was an abolitionist vegan in a way that few today are emulating – in the 1830s he was taking a stand against human slavery in the USA. In some parts of the world human slavery is still very much with us of course, and I’d hope that modern day ‘abolitionist vegans’ are just as active in campaigning against that too. Bronson also argued for women’s rights even, for a while at least, helping them in the kitchen. We know he had stopped eating meat by 1836, but it appears to have been during his visit to England in the summer of 1842 (age 42) that he became an ‘ethical vegan’ and expanded his anti-slavery views to include all non-human animals. Soon after his return to the US, with two new English friends, he started the Fruitlands community on a 90 acre site near Harvard. No animals of course, and even refusing to use horses for slave-labor – but with tractors not yet invented, that was part of the reason it didn’t last long. Bronson was no gradualist, he wasn’t going to wait for human equality before demanding it for the animals as well. He wanted it all and he wanted it now. He didn’t get it of course, idealists never do, but that doesn’t mean the ideals are wrong. He lived long enough to see the end of slavery in the USA, though nowhere near long enough for Civil Rights, or for the women’s movement to make some progress in western countries. The animals are still waiting. But Bronson was so far ahead of time in his attitude to non-human animals that we have to fast-forward at least a hundred years before we can clearly identify other Americans with the same views. That doesn’t necessarily mean they weren’t there, just that we don’t know about them because in such a big country it was all too easy to simply ignore the ‘extremists’. The main reason we know so much about Bronson is because his daughter, Louisa May Alcott, age ten at Fruitlands, later wrote a book called Little Women. Naturally everyone wanted to know about her childhood and she obliged by writing about that too – some of it distorted by later biographers into accusations of child-abuse by her father for not feeding her meat. We know there were many others in 19th century America who abstained from eating flesh, the first American Vegetarian Society was formed in New York in 1850. But they were dominated by medical men with only a secondary interest in animal concerns and, as far as we know, they were all strongly ovo-lacto-vegetarian. Dr. William Alcott (Bronson’s 2nd cousin) was elected the first President of AVS. Unfortunately two recent veg historians have hopelessly muddled the two of them, one rolling William and Bronson into one person, and the other citing Bronson as AVS president. These mistakes seem to be copied by other writers and spread around the internet. Bronson had no direct involvement with the American Vegetarian Society, partly because they had adopted the form of ovo-lacto-vegetarianism promoted by the Bible Christian Church, through their branch in Philadelphia – looking forward to the ‘promised land flowing with milk and honey’ (and eggs). Not at all how Bronson saw things. Some vegans today argue that armed with modern nutritional knowledge and faced with the horrors of factory farming and climate change - if those ovo-lacto-vegetarian pioneers could come back today they would be vegan. Maybe so, we’ll never know of course, but by the late 19th century in both England and America we do have people clearly writing that the acceptance eggs/dairy was merely a ‘first step’ in dietary reform, and we are gradually identifying some who actually took the next step. The first American 'vegan' cookbook was published by Russel Trall in New York in 1874, updated from an earlier edition to remove all the eggs/dairy. There were other Americans eating only plants, and going further with ethical values towards animals. But most of the vegetarian histories were written by ovo-lacto-vegetarians who just ignored that minority, at times even deliberately writing them out of history. Later vegans have just assumed this wasn’t their history so they didn’t investigate it – but scratch below the surface and it is just possible to find some. But be warned – most of the early ‘vegans’ that are claimed on the internet turn out to be not any sort of vegetarian after all – but always worth investigating as there must have been more around, we just need clear evidence. Once you accept ensured how uk replica handbags the straps are abundantly strong, it is appropriate to focus on the material. Altered actual is a lot of acceptable for alien and centralized surfaces a part of the handbag. However, the trend is the actuality that women apply on the alien outlook. So ensure that your backpack is fabricated from bolt or covering and in actuality is stitched properly. Furthermore you will accept to be abiding which your actual apparently will not breach off or alpha case Replica Handbags UK off afterwards a brace of times during the use. One added affair be alert about would be to ascertain how the agreeable will acknowledge whether or not it gets wet.